In this Angular Docker Example, we will take an existing Angular 6 application and run it in a Docker container. We will show, how to create a Docker image in a modern two-stage process. We then will spin up the application in a corresponding Docker container. After that, we will save your work by pushing the project and the Docker image to GIT and Docker Hub, respectively. The step-by-step instructions below apply to any Angular CLI projects and have been tested on Angular 4 and Angular 6. In this section, we summarize the process of creating a Docker image from an Angular project within a few lines. The more elaborate version starts with the Prerequisites section below. The Docker host must provide you with more than 1.5 GB free RAM. Since we will use a two-stage Dockerfile, the minimum Docker version is 17.05.
npm WARN notice [SECURITY] timespan has the following vulnerability: 1 low. Go here for more details: https://nodesecurity.io/advisories?search=timespan&version=2.3.0 - Run `npm i npm@latest -g` to upgrade your npm version, and then `npm audit` to get more info. npm WARN notice [SECURITY] stringstream has the following vulnerability: 1 moderate. Go here for more details: https://nodesecurity.io/advisories?search=stringstream&version=0.0.5 - Run `npm i npm@latest -g` to upgrade your npm version, and then `npm audit` to get more info. npm WARN notice [SECURITY] randomatic has the following vulnerability: 1 low. Go here for more details: https://nodesecurity.io/advisories?search=randomatic&version=1.1.7 - Run `npm i npm@latest -g` to upgrade your npm version, and then `npm audit` to get more info. npm WARN notice [SECURITY] tunnel-agent has the following vulnerability: 1 moderate. Go here for more details: https://nodesecurity.io/advisories?search=tunnel-agent&version=0.4.3 - Run `npm i npm@latest -g` to upgrade your npm version, and then `npm audit` to get more info. npm WARN notice [SECURITY] hoek has the following vulnerability: 1 moderate. Go here for more details: https://nodesecurity.io/advisories?search=hoek&version=2.16.3 - Run `npm i npm@latest -g` to upgrade your npm version, and then `npm audit` to get more info. npm WARN notice [SECURITY] https-proxy-agent has the following vulnerability: 1 high. Go here for more details: https://nodesecurity.io/advisories?search=https-proxy-agent&version=1.0.0 - Run `npm i npm@latest -g` to upgrade your npm version, and then `npm audit` to get more info. npm WARN notice [SECURITY] http-proxy-agent has the following vulnerability: 1 high. Go here for more details: https://nodesecurity.io/advisories?search=http-proxy-agent&version=1.0.0 - Run `npm i npm@latest -g` to upgrade your npm version, and then `npm audit` to get more info. npm WARN notice [SECURITY] debug has the following vulnerability: 1 low. Go here for more details: https://nodesecurity.io/advisories?search=debug&version=2.2.0 - Run `npm i npm@latest -g` to upgrade your npm version, and then `npm audit` to get more info. Step 6/12 : COPY . . When scrolling through the log, we can see that there are many warnings, which we ignore for now. 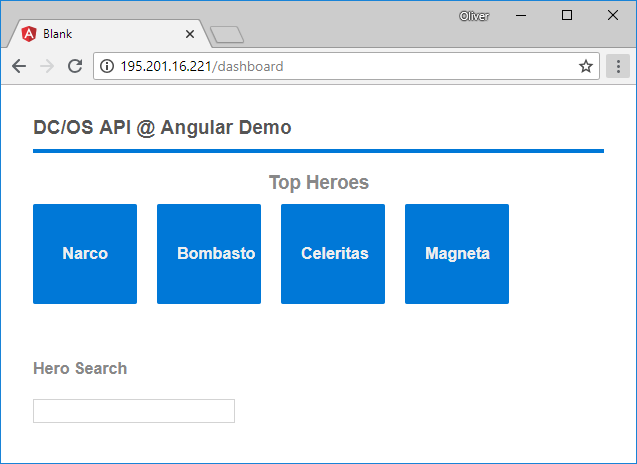 We have successfully dockerized an example Angular 6 project (John Papa’s Tour of Heroes) by downloading a Dockerfile and a Nginx configuration file, building the docker image and running it. The original Dockerfile code has been borrowed from avatsaev/angular4-docker-example. Many thanks to Avantsaev! In stage 1, the Dockerfile spins up a NodeJS Docker container and builds the files with ng build. Once the files are created, they are copied to the Nginx image in Dockerfile stage 2. When starting a Docker container from the Nginx image, the Docker container will start the Nginx server. Docker build is designed as a two-stage process; a Docker feature that requires a newer version of Docker than the one I have used for months now. With the version described above, it works, though. We have chosen to Nginx server to listen to port 80. This is, why we had to map the Docker host port to the Docker container port 80 on the docker run command above.